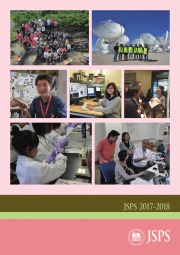 The Japan Society for the Promotion of Science (JSPS) carries out programs that provide overseas researchers who have and excellent record of research achievements with an opportunity to conduct collaborative research, discussions, and opinion exchanges with researchers in Japan. These programs are intended to help advance the overseas researchers’ research activities while promoting science and internationalization in Japan. 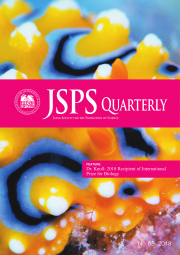 Following deadlines are for the head of host/ nominating institution to submit application to JSPS Headquarters/ NSF; the time frames for applicants (host researchers) to submit their applications are normally earlier. Our fellowship program is designed to accommodate needs of researchers at various level. *For applicants in Canada, all applications must be submitted to Mitacs. For applicants in the U.S., National Science Foundation (NSF) terminated this program in 2017. The new selection system is under review, and the open call is not conducted this year. The amounts of the Awards indicated below are subject to change for budgetary reasons. 4. Overseas travel insurance coverage, etc. Note 1: For the fellow who has been living in Japan (and has a mailing address) before the fellowship starting date, the “traveling expense” of outbound flight and a “settle-in allowance” will not be paid. Application is submitted directly to JSPS Headquarters by host researcher in Japan on behalf of applicant. Application is submitted to National Institutes of Health (NIH) or Social Science Research Council (SSRC) by US-based applicant. 3. A settling-in allowance of JPY 200,000, Overseas travel insurance coverage, etc. Note 1:The terms of the Awards indicated above are subject to change. Note 2: For the fellow who has been living in Japan (and has a mailing address) before the fellowship starting date, the “traveling expense” of outbound flight and a “settle-in allowance” will not be paid. A “Grant-In-Aid for Scientific Research” (Tokubetsu Kenkyuin Shorei-hi) of up to JPY 1,500,000 per year (total of JPY 3,000,000 for two years) is available to cover cooperative research-related expenses. Application for these grants is made by the host researcher through his/her institution. Application is submitted to National Institutes of Health (NIH) or Social Science Research Council (SSRC) by US-based applicant, or is submitted to Natural Sciences and Engineering Research Council of Canada (NSERC) or Canadian Institutes of Health Research (CIHR) by applicant in Canada. Application is submitted to the JSPS Washington Office by applicant (the member of the JSPS US Fellows Alumni Association). The JSPS Washington Office is announcing the BRIDGE Fellowship for 2019. 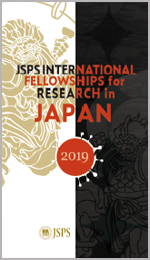 This fellowship award will be carried out as a component of the JSPS’s initiative to build strong networks among researchers in Japan and other countries. 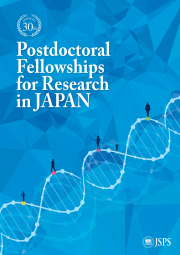 The BRIDGE Fellowship will give former fellows of JSPS programs an opportunity to create, sustain and/or strengthen research collaborations with Japanese colleagues by revisiting Japan. Eligibility for this program is provided exclusively for the registered members of the US-JSPS Fellows Alumni Association. The Call for application is now open to the eligible members and materials will be sent directly to the JSPS former fellows. If you are an alumni member and have not received the materials, please contact us. Applications is submitted to JSPS Headquarters through institution in Japan or by individual. This deadline is also for the head of applicants’ institutions to submit application to JSPS Headquarters; the time frames for applicants to submit their applications are normally earlier. Application is submitted to National Institutes of Health (NIH) by individual applicant. JSPS Postdoctoral Fellowship (Short-term) for Researchers in the U.S.